Lexus V8 conversions done since 2003 on vehicles such as Toyota Hilux, Mitsubishi Pajero, Mitsubishi Korando, Jeep, Toyota Hi-Ace, Merc Sprinter, Toyota Landcruiser and many more. Perf & Std Exhaust Systems. Turbo conversions. 4x4 Lift Kits installed. Landrover Discovery V12 Monster Truck available for promotions, school projects, money raisers, advertising etc. Ek het n 80 series Cruiser met 4500 petrol engin. Dis 'n Ausie Spec import van 1995. Ek wil weet wat 'n Lexus V8 engin ombouing sal kos, wat is die verskil in brandstof verbruik, performance en hoe lank die goed leef as mens daarna kyk onder normale rytoestande en soms 'n 4x4 roete. Is dit die moeite werd of is daar beter ombouings. Ek soek beter brandstof en dalk meer krag, my engin het oor die 300 000 km op en die ratkas begin uit 1ste spring. Moet ek liewer hou by wat ek het of is daar groot voordele in die Lexus? Hi ek het 'n Mitsubishi L300 Motorhome met 'n 2 ltr masjien kan julle 'n v6 inbou.Laat weet asb. Dankie Hennie. i've done an engine conversion on my '91 corolla, from a 2E 12v to a 4A-GE 20v. i also bought a spitronics ecu package & all has been installed, but i'm struggling to tune the engine correctly, the car goes goes but the fuel mixture is too rich. does your workshop do tuning on spitronics products & do you also do dyno tuning? i've done an engine conversion on my '91 corolla, from a 2E 12v to a 4A-GE 20v. i also bought a spitronics ecu package & all has been installed, but i'm struggling to tune the engine correctly, the car goes but the fuel mixture is too rich. does your workshop do tuning on spitronics products & do you also do dyno tuning? 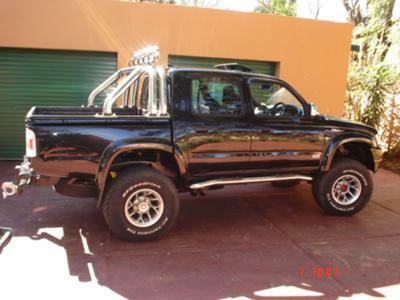 I have a Ford Ranger with a Lexus V8 conversion that was done by so called experts - North of Pretoria. It was absolute chaos to the extend that I wanted to sell the vehicle. By chance I got in contact with Phillip. What a change to speak to somebody that actually knows what he is doing and what he is talking about. He took my old rattlebox and transformed it into a vehicle that I can be proud of. He is an expert and perfectionist in this field and believe me if anything else needs doing on my vehicle, he is the man that will do it. I am truly grateful that there are still people like Phillip around.